The stunning landscapes of Jiuzhaigou National Park in northern Sichuan province make it one of the best places to visit in China; unfortunately thousands of other people have the same idea as you when you go there. As such, lines for the buses that carry tourists around the massive grounds tend to be, well, ridiculous. 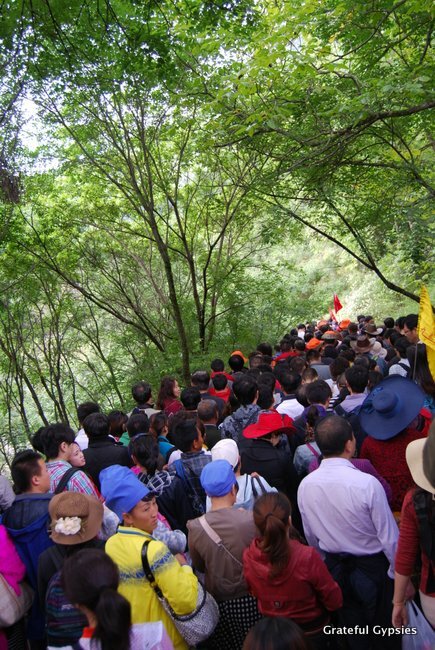 There’s a great Chinglish saying that goes “people mountain people sea” and that’s certainly the best way to describe the crowds that you’ll encounter at the entrance and around most bus stops in the park. Although there’s much to admire in terms of natural beauty there, most visitors are simply concerned with pushing their way up to the sign that displays the name of whatever lake/waterfall/rock it is they are standing in front of so that they can snap at least 10 photos while flashing the “V for victory” sign (it’s not the peace sign over here, ya hippie). After enough pictures have been taken, it’s time to head back to the bus stop and push and shove onto the next bus. You know, because who wants to walk around in a national park? That’s not to mention the “traditional Tibetan villages” that are actually mainly serving as souvenir shops, tea houses, and smoking rooms for the hordes of Chinese tourists who pack the park on a regular basis. Walk in hoping to find a peaceful oasis of Tibetan Buddhist monks praying, and instead find a bunch of touristy knick-knack shops. Now don’t get me wrong here, I still think it’s an amazing place. It is stunningly beautiful, with crystal clear lakes, soaring mountains, and rushing waterfalls. Even though some of them may have been converted into souvenir stalls, the local villages do retain much of their unique culture, and the people are incredibly friendly. Despite my previous rant, Jiuzhaigou remains my favorite place I’ve visited in China. That’s not because of the national park itself, however – it’s because of the 3-day eco-tourism hike that we did through the valley nearby the park. 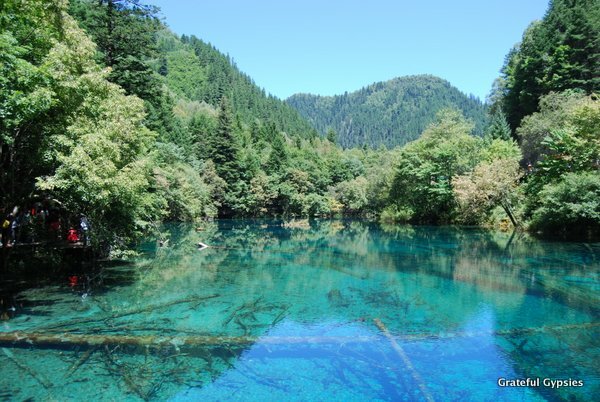 Until recently, it was forbidden for visitors to get off the beaten path around Jiuzhaigou. To this day, sleeping within the massive grounds of the national park isn’t allowed, even for Chinese people. Those wishing to explore the natural wonders of the area sans paved roads or buses were basically S.O.L. That is, until the Zharu Valley eco-tourism hike came about. Opened a few years back in 2009, this strenuous hike gives adventurous travelers the chance to escape the crowds and challenge themselves, all while learning a lot about the local environment and culture. 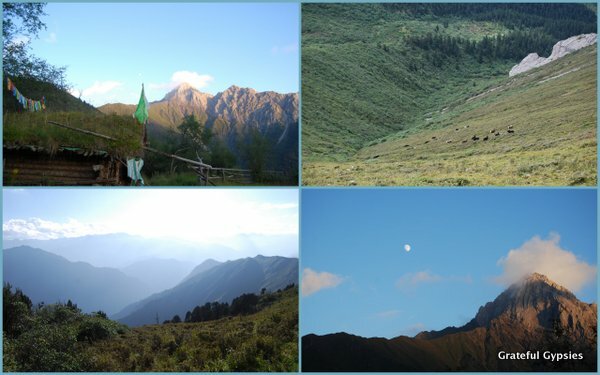 Small groups join a local, knowledgeable guide for either a one, two, or three-day trek around a sacred mountain peak – Zha Yi Zha Ga. 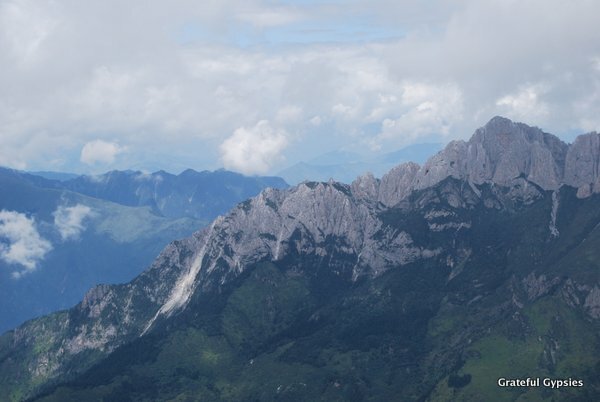 The peak of this mountain stands at over 4,500 meters high, and it has been an important site for followers of the Benbo religion – an ancient sect of Tibetan Buddhism – for many years. 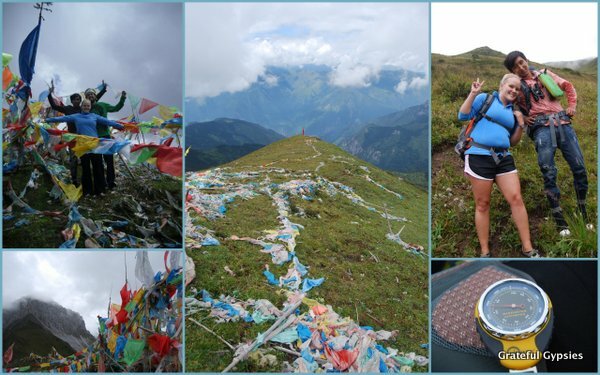 Participants carry large backpacks and spend the whole day hiking up hills, across streams, around waterfalls, always being guided by the colorful Tibetan prayer flags that billow in the wind and help to show the way. Each color on the flag is a symbol of an element – blue is the sky, white is air, red is fire, green is water, and yellow is the earth. In a way, these flags serve as a guiding light for people who make this pilgrimage now, from their ancestors who did it many years before. Massive peaks are everywhere you look out here. Our guide was a local guy called Xiao Ge, who told us he grew up in these mountains herding yak. The hike, which took our group a full three days, could probably have been done in less than one had it only been him. Despite the thin mountain air, high elevation, and rough terrain, we never once saw the guy gasping for air or eager to take a rest. In fact, in the three full days of hiking, we saw him smoke more cigarettes than take drinks of water. As he told us, “I just drink a little bit of salty tea in the morning, and I don’t need water for the rest of the day.” I wish I could say the same for the rest of us. I thought we were coming into the hike in pretty good shape, but he really made us second-guess ourselves. Some scenes from the first day of the hike. Prior to the hike, we had been advised that a “decent level of fitness” would be required to complete it. As such, we weren’t expecting too much. Boy were we wrong. Our backpacks were weighed down with supplies, and the “trail” was at times no more than a bunch of shrubs and trees that had apparently been cleared by a machete not too long ago. We stomped through mud, walked up slippery rocky slopes, waded through streams, and just about any other surface you could imagine on a hike. Finally, after a good eight hours or so, we arrived at our accommodations for the night – a tiny wooden shack in the middle of nowhere. Hands frozen, backs sore, lungs collapsing, we all sat down on the wooden boards inside and lit a fire. Our shack for the night. For dinner, we unloaded our bags full of rations for the hike, which by the way were clearly purchased by a Chinese person who was neither coming on the hike, nor had ever been on a hike before. For three days of intense hiking, we were all given: Snickers bars, canned sardines, a few apples, a box or two of milk, a handful of Spam sausages, and at least ten bags of instant noodles. It was a glorious meal, anyways, and we topped it all off with a few shots of rocket fuel, AKA Chinese liquor. Despite being crammed like sardines ourselves, as there were five of us sharing the one “bed” in the shack (and by bed I mean handful of wooden boards), most of us were sound asleep by 8 PM. A video highlight of day one of the hike. For Day Two, we did our best to lighten our load by eating a huge breakfast of instant noodles and milk. Breakfast of champions! We then headed out and continued uphill. It took us a few hours with a lot of pit stops, but we finally reached the summit. Completely covered in prayer flags, it was immediately clear that this mountaintop is very spiritually significant for the local people. Xiao Ge wasted no time in performing the ritual ceremony. He tossed about small squares of paper containing prayers to be carried away in the wind, and he tidied up the mass of prayer flags atop the mountain, just like his ancestors probably did hundreds of years ago. Unlike his ancestors, I’m sure, he then plopped down on the grass, lit a cigarette, and started blasting some tunes on his iPad. Although it was just another walk in the park for him, we felt rather excited and proud standing there at nearly 4,000 meters above sea level. We made it to 4,000 meters! On the way down, we saw herds of yaks wandering across the hillside. Xiao Ge hollered and yelled at them from quite far away, and yet still managed to scare the entire bunch enough to the point where they all started running. For him, seeing a few hundred yaks running free on a mountain is probably just as common as me seeing someone walking their dog. Throughout the hike, we both spent a lot of time asking about each other’s hometowns, families, and so on. It’s these exchanges that make me appreciate the fact that I can at least somewhat communicate in Chinese. I knew our guide appreciated it as well, seeing as how he kept telling me about the previous group he had taken out, and how their language barriers resulted in a few days of awkward silences and body language. 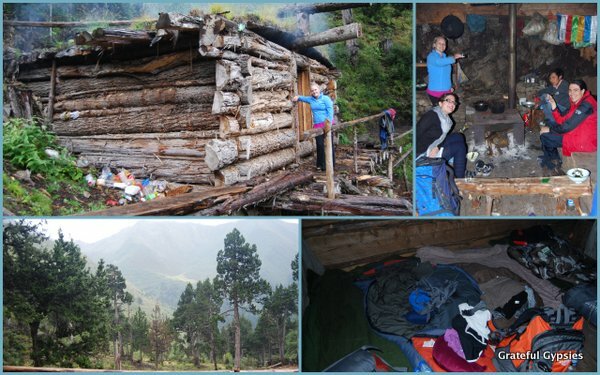 Yaks and shacks – common sights on the hike. That evening, we reached yet another shack that we would call home for a few hours. While the rest of the group was inside warming up and boiling yet another bowl of instant noodles, I found myself outside, enjoying the incredible view of the moon and stars, watching my breath disappear into the cold mountain night. I thought back to the hordes of tourists I had encountered a few days earlier inside of the park, and I just hoped that some of them would get to experience something similar at some point – standing out in the middle of nowhere, surrounded by nature, and free of the ties that bind us to our daily lives. Living in the most populous country on Earth, in one of the most crowded cities on Earth, I’ve come to cherish moments like this. Make it to the peak and more in the 2nd day’s video. On the third and final day, we headed out in the morning for a few more hours of hiking. We saw wild horses roaming free, picked delicious berries, and admired the natural beauty of the mountains and valleys that surround the area. A few hours later, we arrived in one of the local villages. Inside, some of the locals had already prepared a massive lunch for us. Having sustained off of Ramen and Snickers bars for the previous few days, we were incredibly grateful for their hospitality. 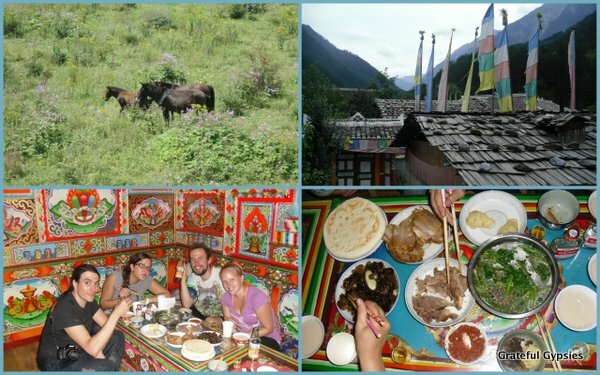 In accordance with the local culture, we ate roast meat and drank both yak butter tea and plenty of barley wine. Although there wasn’t much special about this particular lunch at all, it was probably one of the more satisfying meals we’ve ever had. Wild horses roaming free, and an amazing lunch. Once the plates were clear and the glasses were emptied, it was time for our group to split up and go our separate ways. That’s the thing about traveling like this – you get so close to people for a few days, and then you say goodbye, most likely never to see them again. Our hiking companions headed out in the van, while the two of us chose to join Xiao Ge on a downhill bicycle ride back to the main entrance of the park. Cruising along past rushing rivers and watching the mountaintops fly by was the perfect way to end the adventure. Back in civilization, we took Xiao Ge up on his offer to go to a nightly barbecue party. Inside, locals sang and danced, while groups of Chinese tourists snapped cell phone pictures and chowed down on some roast lamb. Of course, most of the people in the area work in the tourism industry in one way or another, whether it be driving a bus in the park, singing Tibetan songs for obnoxious tourists, or patiently waiting for your less in-shape hiking group to catch up with you. 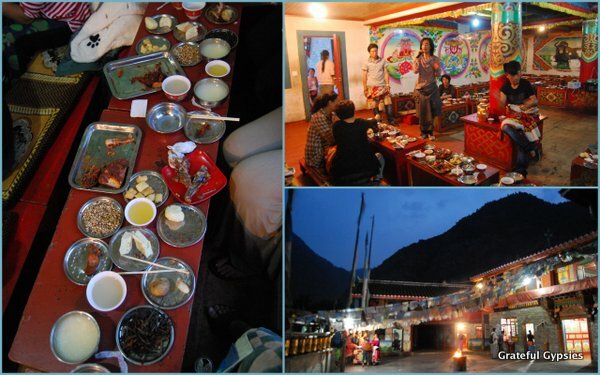 A Tibetan style dinner party. In the end, we were happy to support all of them, for they were some of the nicest people we’ve ever met, and their home is one of the most beautiful places we’ve ever visited. While talking with locals there, we were constantly told how lucky we were to live in Beijing, in the capital city where everything was modern and exciting. Meanwhile, we were thinking how lucky they were to live out in the mountains, free of the dangerously polluted air and consumer culture of the big city. Here we were, these urbanites used to a nice heated apartment, international cuisine, and the ease of public transportation. We had just spent three days lugging a heavy backpack up a mountain, living off of instant noodles, sleeping on an uneven wooden board with rodents scurrying beneath. We envied them, and they envied us at the same time. I guess the saying is true – the grass really is greener on the other side. Third and final video on the Zharu Valley Hike. 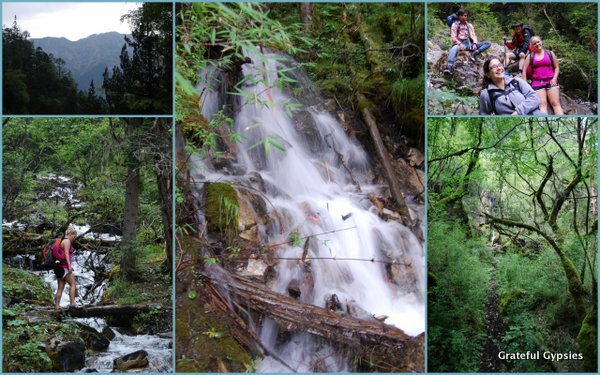 For more information on eco-tourism in the area around Jiuzhaigou, visit this website.